Just place this Vibrating Alarm Clock "inside your pillowcase". The intense pulsating vibration from this e-pill alarm clock with One (1) Daily Alarm will awaken even the deepest sleeper when it is time to take medications or just wake up! Wake-Up Guarantee: 30 Day Money-Back Guarantee! The "Shaking" alarm clock is a unique and revolutionary invention that was originally designed for the hearing impaired. Also used by the tourist, boarder, married couples etc. 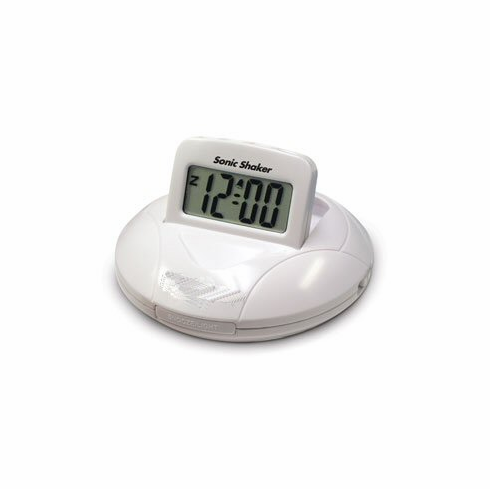 Great for patients that need to take medication during the night without waking up a spouse. Size: 3 3/4 " Round x 1 1/2" Thick | Weight: 6.5 oz w/ batteries and travel case included. Complete with batteries (3), ready to go. Color: White | FREE Batteries 1 x AAA, 2 x AA (included) | Large digits 3/4" high (easy to read) | Protective travel case. Shipping: FREE Standard Shipping for US Customers.